After school, Professor asked if she could see my new Computer GIRLS! "Computer Girls" is a sort-of goofy, electronic sound collage instrumental. The lines above are a sample which repeats throughout it. The song begins with a riff, which sounds a rudely plucked electric guitar doing a cheap country thang. All sorts of percussion sounds make up the rhythm. Some noise samples (including a voice speaking the above lyric and a theremin-like sound) are included. Some heavier buzzing electronics make up a short bridge. It's not nearly as hectic as that description sounds! The song is not available in any commercial form, but it was included in the film Condo Painting. 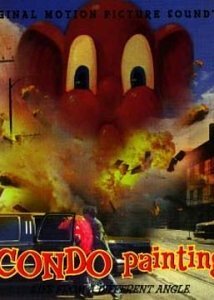 This was a documentary about the painter George Condo. The documentary had a soundtrack too, but the song is not on it. Here is some examples of George Condo's paintings. Here is his Wikipedia page.